Rei Kurosawa devotes herself to her work, trying to shake off the grief at the loss of her beloved fiancé. However, after a certain occurrence, her life is turned on its head. In Zero: Shisei no Koe, you will solve the mysteries of the mansion you visit in your dreams whilst coming and going between reality and the nightmare. With each new entry in the series, the fear evolves. The setting and world are also created in an incredibly detailed manner. We spoke to Mr. Keisuke Kikuchi, its creator, about what was put into the game. Kikuchi: In the game, the spreading of a cursed tattoo is an element central to the story. The "shisei" (tattoo) part hints at several things directly and indirectly, which gradually become clearer as you proceed through the game. The "koe" part doesn't mean "voice" here, but rather "call". It's as if you're being called to by something scary, something terrible. It also has the character for the concept colour, blue, in it, so I quite like it. ―I see. Was there some specific reason behind making an adult female the main character? Kikuchi: The game's story is based upon "suffering". We wanted to make the protagonist someone with a degree of life experience, at an age where she could take that pain. If she were too young it would simply end at sadness being sad, pain being pain. We wanted her to be an adult who, despite losing a person dear to her in the opening, lives on while shouldering that regret, grief and suffering. But the theme wasn't particularly forced. That might be presumptuous (laughs). If you play it and enjoy it and are scared, and it makes you feel something, that's everything. What we have to be persistent about is creating a story, world and space that is immersive, constructing a scary atmosphere and a world with depth, and being careful with each character's background. ―Did the three main characters come from a gameplay perspective? Kikuchi: We approached it from two directions: "background" and "gameplay". The former is hurting those close to you and feeling isolated. We also wanted each character to have their own variation on scariness. For example, Miku Hinasaki has a petite figure and can squeeze through small spaces, which is really scary. That claustrophobic feeling for Miku is scary, and Kei's hiding so as not to be found by ghosts has a sense of excitement about it. They each also have their own characteristic abilities, increasing playability. Naturally, since the fighting style changes you'll have to use your head (laughs). Miku has strong spiritual power, so of course she's strong in battle. She also has the ability to slow a ghost's movement. However, she can't use special shots. Kei is incredibly weak, but he can hide and use a lot of special shots. Just make sure you enjoy the world beneath the floor (laughs). ―How did you come up with the idea to switch between two worlds? Kikuchi: With the first game we created a scary environment, and with the second game we created a scary and sad world and story. For this game, we focused our attention on the game system during development. Zero is a horror game, not a film (laughs). We used a fantastical scariness in the last game, so in Shisei no Koe we leaned towards a clearer, easier to understand fear. That train of thought was what led us to a system where you switch between reality and the nightmare. You can also analyse the information you obtain in the dream when you're in the real world. We thought it would be good for exploration of the nightmare manor to feel like holding your breath and diving into water. If you find something new you might want to keep going, but it's realistic that if you can't take any more you're going to surface for a breath. Those who can make it should stay under for a long time, and those who want a bit of respite to catch their breath should occasionally return to reality. I think that by making the game unfold more actively, that let us be attentive to the parts that appeal to the player's imagination and thinking ability. You don't just simply enjoy the scariness and the story; if you do some things you can learn more about the world, too. There are difficult kanji in the old books in the game, and there's a rich variety of information in things such as photos, cassette tapes and films. If you investigate these and put them together in your head, the world expands. A summary of the information is also kept in your notebook, so even beginners will be fine (laughs). Everything was set up to make the game worth your time. ―Is there anything in particular you focus on when making scary happenings? 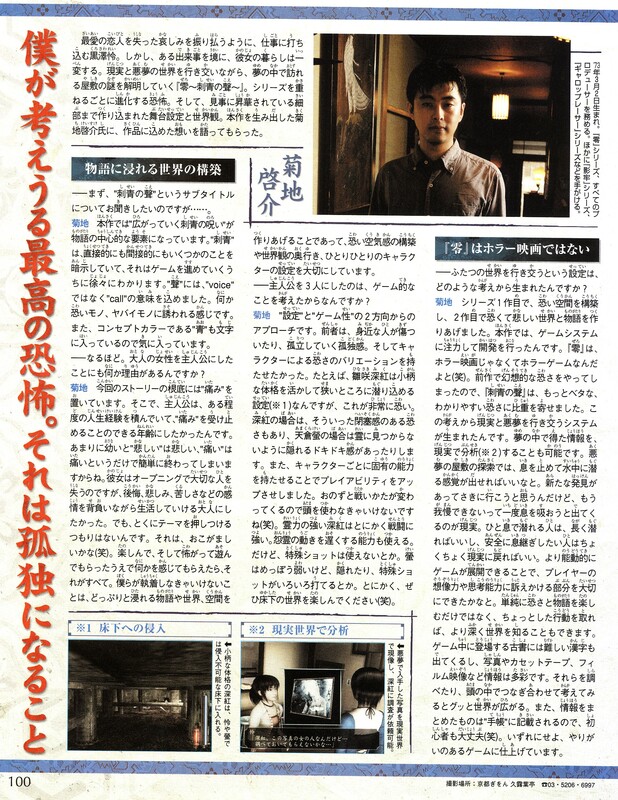 Kikuchi: I think that there's something like a formula for scariness. If you purposely pause for a second when you're at your most powerless and suddenly think "huh?" that's really scary. But if you do that every time then people are put on alert for it, so we put in things that are scary just by being there throughout the story and mansion, to give it atmosphere. Also, sound is of course the lifeblood of a horror game, so we paid attention to things like faint whispers and footsteps. Feeling presences and bringing out the atmosphere is tied to making you imagine the fear. That, and the fact that the ghosts in the game are pretty scary (laughs). Compared to the second game, they've been created with finer detail in things like effects and eye movements, as well as the way the tattoo appears and other things. We spent a lot of time on creating each ghost one by one, so I think a vivid scariness comes from them. ―What is the scariest thing in your view? Kikuchi: I think isolation is the scariest. Isolation stops you from connecting with other people, and I think that in the end even dying is lonely. Besides this, even if there's someone nearby, if you aren't close to them you're isolated, which is the scariest. I think that fear is an instinctive means of self-defence given to humans, serving as a cushion to avoid damage when you're harmed. If you don't feel "fear", you might suddenly die of a heart attack. I believe that feeling scared is a kind of mental preparation, a defence mechanism for avoiding death. I guess that means that death is the scariest thing, then? ―And that scariness is in the game. Kikuchi: Yeah. If you want it to be scarier, please play it late at night in a dark room while wearing headphones (laughs). The scary atmosphere is made to be limitlessly real, so you can become immersed in the world the way you enjoy it. That, and make sure you get to the ending! I won't say whether it's a good or bad one, though (laughs). In the past in the series, the ending has always finished with "becoming zero". This game will grip you. The story begins with the protagonist in the worst situation, and you really have to see how things come to their conclusion at the end. Besides this, we've prepared all kinds of things you wouldn't want to happen in reality to your own house so you can feel the fear of everyday things and abnormality. Things like scary happenings in the shower (laughs).